In a day when Asian restaurants are as common as frozen yogurt shops, it’s nice to discover one that stands out from the pack. 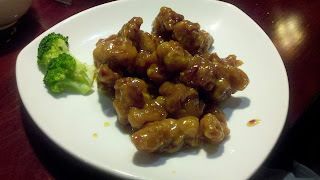 Cary’s Ginger Asian Cuisine is a worthwhile dining destination for quality Chinese and Thai fare at a reasonable price. If you are a fan of eggrolls, it’s well worth spending an extra 50 cents at lunchtime to enjoy Ginger’s crispy version. Also satisfying is the tangy hot and sour soup. When it comes to Chinese entrées, you can’t go wrong with General Tso’s or Kung Pao chicken. As for Thai selections, while Pad Thai is bargain priced at less than $7, the dish isn’t nearly as noteworthy as, say, the Thai Basil Sauce with shrimp. One benefit for LifeTime Fitness Members: the restaurant offers a 15 percent discount when you show your gym membership card. Speaking of LifeTime, Ginger even offers a special heart-healthy menu that was developed in collaboration with the nutritionist at the Cary workout facility. Almost as impressive as the food is Ginger’s tranquil ambiance. Earth toned walls, dark wood accents and unobtrusive, gracious servers enhance the overall dining experience. The one drawback: parking can be challenging at this busy shopping center (Crescent Commons) that anchors both a Walmart and a Harris Teeter. Once you do find a space, though, you’ll be glad you made the effort.